Finding a team that is located close to where the family lives or where the child is being treated is important. This allows the family to conveniently get to campus, in addition to allowing the student athletes to do activities off-campus with the child. Identifying the team that is the most enthusiastic about drafting a TI child onto their roster and is committed to providing the child with consistent and active socialization both on and off campus. 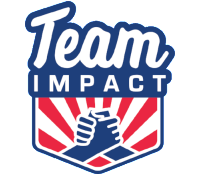 Participating Team IMPACT teams are fully trained on how to be the best teammates and role models they can be to their youngest teammate. Team Training focuses on understanding the child and family’s situation, the impact they have on the child’s quality of life, and maximizing the value of the relationship. The Draft Day is when the team will officially ‘draft’ the child onto their roster making him/her an official team member. The team plans their individual draft day and can consist of signing ceremonies, press conferences, handing out an official team jersey, a locker in the locker room, and being announced before the start of a game. More than anything, the Draft Day marks that from that point forward, the child is an official member of the team. Through a structured ‘relationship management methodology’ we cultivate each relationship to ensure that meaningful bonds are formed and that we are measurably improving the quality of life for these children and their families. We manage each relationship through active and consistent communication with the participating family and team. Each relationship is assigned a Relationship Manager who will ensure it is maintained to the highest quality possible from Draft Day through to Graduation. It is our belief that graduating and transitioning back into their typical routine will lead to the best long-term benefits for the child. It is typical for each relationship to last 2-3 years but as each child is different, the timing of graduation varies for each relationship. Graduation is celebrated similarly to the Draft Day and focuses on the child’s accomplishments and impact they have had on their team. Once graduated, the child can still maintain a relationship with their team, but will join their fellow graduated teammates as an alumnus. 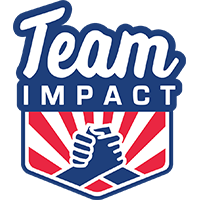 As a Team IMPACT alumnus, the child will always be affiliated with their team but will allow the team to draft another deserving child onto their roster.